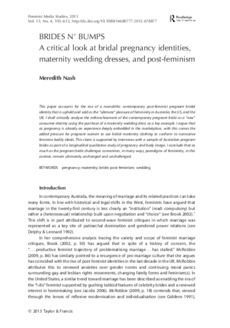 This paper accounts for the rise of a monolithic contemporary post-feminist pregnant bridal identity that is upheld and sold as the "ultimate" pleasure of femininity in Australia, the US, and the UK. I shall critically analyse the enfranchisement of the contemporary pregnant bride as a "new" consumer identity using the purchase of a maternity wedding dress as a key example. I argue that as pregnancy is already an experience deeply embedded in the marketplace, with this comes the added pressure for pregnant women to use bridal maternity clothing to conform to normative feminine bodily ideals. This claim is supported by interviews with a sample of Australian pregnant brides as part of a longitudinal qualitative study of pregnancy and body image. I conclude that as much as the pregnant bride challenges convention, in many ways, paradigms of femininity, in this context, remain ultimately unchanged and unchallenged.